Fears about laws and changes in regulations on abortion that might advance under a new Democratic-run Congress and White House are the central focus of a statement approved by the U.S. Conference of Catholic Bishops Nov. 12 during their annual fall meeting in Baltimore. The statement was crafted during the bishop’s meeting and involved a total of nearly three hours of discussion on the topic during executive and public sessions Nov. 11. 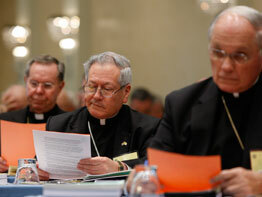 Under USCCB policies, statements drafted outside the usual committee approval process may be issued by the conference president on behalf of the bishops. The final product was written under the supervision of Cardinal Francis E. George of Chicago, USCCB president, after the bishops weighed in with a wide range of recommendations about its content, tone and writing style. After an overnight writing session, the statement was read by Cardinal George to the body of bishops, who greeted it with applause. The statement elaborated a range of concerns about the proposed Freedom of Choice Act, including concerns that it would “deprive the American people in all 50 states of the freedom they now have to enact modest restraints and regulations on the abortion industry.” It said the bill “would coerce all Americans into subsidizing and promoting abortion with their tax dollars,” and would counteract any efforts to reduce the number of abortions in the country. The Freedom of Choice Act has been introduced in at least the last four sessions of Congress without any action. Other versions go back to the early 1990s. In 1993, when Democrats controlled both houses of Congress, the Senate Labor and Human Resources Committee approved that year’s version. But it never reached a floor vote and saw no action in the House. In a January 2008 statement, Obama said he would support passage of the Freedom of Choice Act. The latest version introduced in April 2007 is intended to take effect if Roe v. Wade is overturned, re-establishing federal protection of legal abortion, regardless of what state laws might exist. If the election “is misinterpreted ideologically as a referendum on abortion, the unity desired by President-elect Obama and all Americans at this moment of crisis will be impossible to achieve,” it said. Besides alienating tens of millions of people, erasing restrictions on abortion “would be seen by many as an attack on the free exercise of their religion,” it said. During discussion of the statement at the bishops’ meeting, some bishops raised the point about not taking the election results as a green light for changing abortion policies. Others seemed to prefer that the statement take on other issues, such as how the church responds to Catholic politicians whose political actions seem to conflict with church teaching. Bishop Joseph F. Martino of Scranton, Pa., said though he realized the statement would not address that topic “we are going to have to speak as firmly as possible to Catholic politicians who are not merely reluctant to vote pro-life, but are stridently anti-life.” He noted that in ages past the U.S. bishops took canonical measures against Catholic politicians who supported institutional racism. Some bishops encouraged narrowing the statement’s focus; yet others wanted it expanded in various ways, including inserting quotes from Pope John Paul II. Bishop Blase J. Cupich of Rapid City, S.D., recommended emphasizing Obama’s campaign call to personal responsibility. “That was a message that resonated with the prominent Catholics who decided to support him and it may be the basis for seeking common ground,” he said.